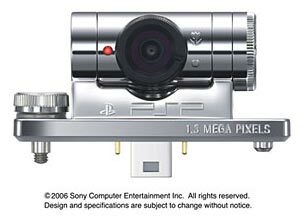 Remember back in 2004 when photos were snapped at CES of the PSP camera accessory? The blogosphere and gamers alike were all alight with anticipation – at the time the idea of having a camera on your PSP was more exciting than words could say. Why Sony hasn’t released the PSP camera here in the states is beyond me, but thank heavens for Play-Asia. The PSP Camera is “region-free” and can be used on any PSP. Photographer and technology critic Ed Steele is the creator and editor of GadgetMadness and has been finding and reviewing the coolest gadgets first since 2003. This s*** is cool where could you get!!! Sweat!! Where can I purchase this and how much will it cost? Is it even in the U.S yet? were did u get this? and how can i get one? i have one nice camera & video! !